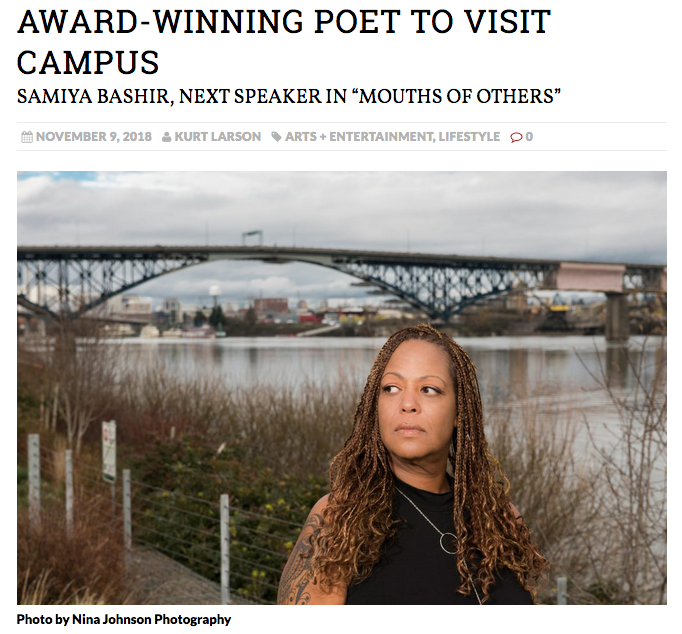 Nationally recognized, award-winning poet Samiya Bashir will hold a special poetry event on the Mt. Hood campus on Thursday, Nov. 15. She will read selections from her poetry book and discuss these and other works from 1 to 2 p.m. in the Visual Arts Theatre. Her visit is the latest in the “Mouths of Others” speaker series hosted by the MHCC humanities department. Bashir is currently an assistant professor of creative writing at Reed College in Portland, and is held in high regard in the modern poetry community at large. She earned a bachelor’s degree from the University of California-Berkeley and a master’s degree in fine arts from the University of Michigan. She’s a founding member of Fire and Ink – an African-American-centric, LGBT, writers festival and advocacy group. Bashir’s works focus on countless varied and complicated topics, ranging from the daily melodrama and insanity of life, to reflections of her existence as an African-American in the world today. Her latest book, “Field Theories,” takes a hint from the laws of thermodynamics and plays with double meanings surrounding scientific vernacular and terminology, such as “Blackbody Curve” or “Blackbody Radiation.” She contrasts the jargon with the primarily white-dominated field of science, and much of the world as a whole. Besides her writing, Bashir has produced works in the form of various multimedia projects, ranging from short videos and audio clips to photos and art installments. To help promote the release of her new book, she teamed up with visual artist Roland Dahwen Wu to create an impressive series of short, spoken-word re-imaginings of her poems. Her work has been described as psychedelic and even “mind-warping,” and her performances are powerful.